Open the flow you want to add your Highrise activity into in CA Flowdock. 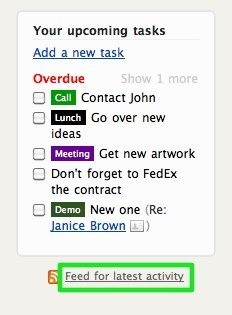 Click the ellipsis icon next to your flow's name, and select Integrations. Click on "Add new" next to RSS feeds. Paste your new URL here and click on "Add feed". You should now receive Highrise activity into your team inbox.